School bathrooms can often be a gross and dreary place (at least the ones in my very old school building were), but a recent trend has them being used for more than just their intended purpose. I mean, of course we need school bathrooms to be functional and allow students to get in and out and back to class quickly, but what if they could also be…inspiring? What if students could be encouraged while doing their business, and walk back to class with a spring in their step? 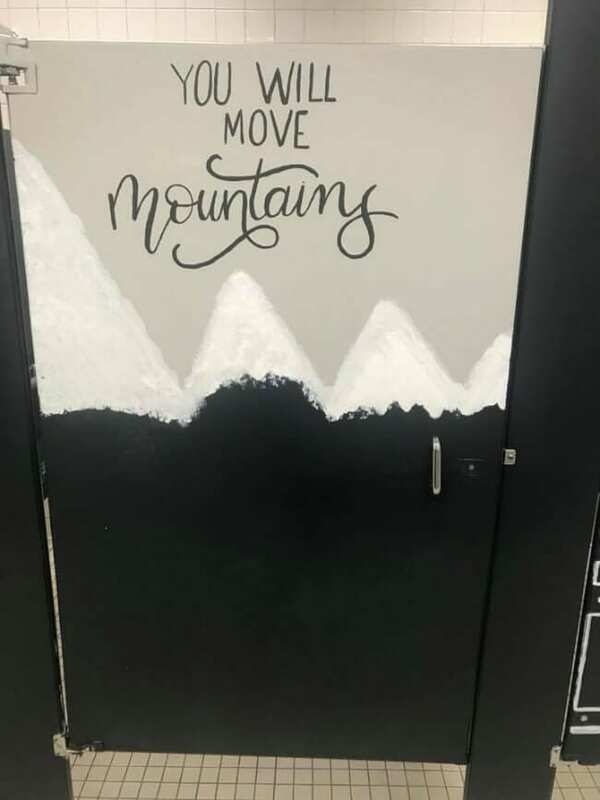 A quick Pinterest search for “paint school bathrooms” or “school bathroom decoration ideas” will bring forth a ton of images and ideas, showing that this trend isn’t an isolated one-off. From elementary to high school, parents and faculty are getting involved in making school bathrooms a place of positivity. 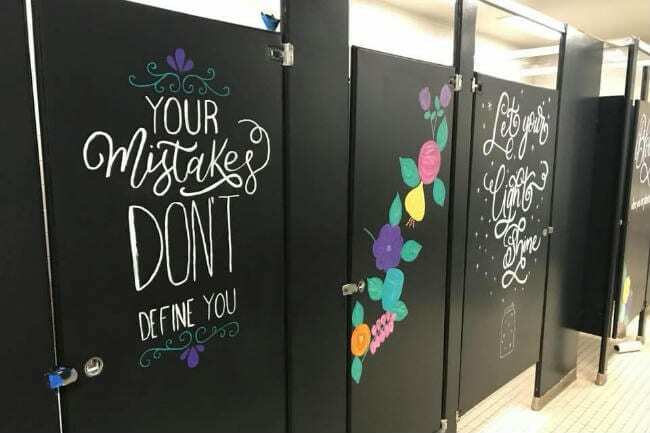 One elementary school, Mary Moore Elementary in Arlington, Texas, has seen the power of a positively-painted bathroom first hand. 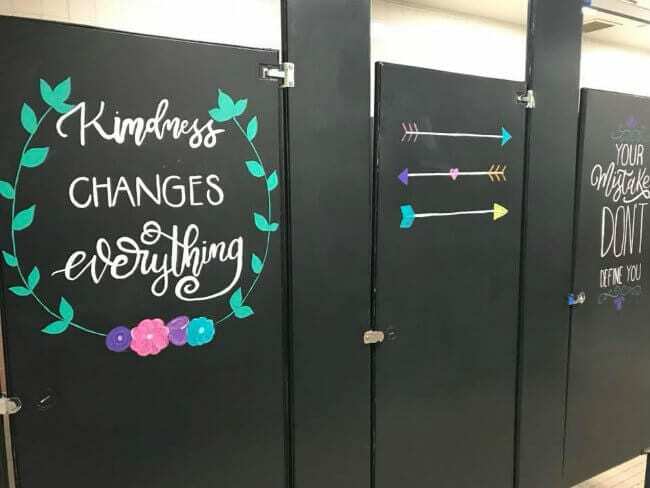 Last President’s Day weekend, school parents came together to give the school’s bathrooms a facelift to go along with the principal’s school year theme of finding joy. Principal Jones says he’s proud of how the kids have taken ownership of their newly-refurbished school bathrooms, and rebuffs critics who worry that the kids will undo the hard work with vandalism. I have to agree with Jones; I think the demands of state testing have taken the fun out of learning for kids and the fun out of teaching for teachers. I admire this man’s determination to bring positivity into his school and to help students and teachers alike learn how to make the best of and do their best with what they’ve got—and find a little joy along the way. Even if the place they find it is on the inside of the door of a bathroom stall. The parents of Mary Moore Elementary, encouraged that so many people took an interest in their school bathrooms makeover project, even created a Google doc for other parents to show them how to do the bathrooms in their kids’ schools! That’s right, these joy-seeking parents started a school bathrooms makeover revolution! I mean…I love the fact that they didn’t just say “gosh golly gee, thanks!” They said, “Here! Let us help you do the same!” If that’s not spreading joy, I don’t know what is! 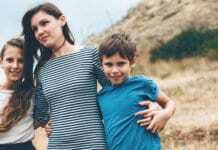 In an era where, quite frankly, school can be a terrifying place, I love that this principal and parents—and those like them in other schools around the country—have reclaimed school bathrooms as places of positivity and joy for their kids. I have a feeling when kids wash their hands at these sinks, they can’t wash off the infectious positivity that’s behind that bathroom door, and end up spreading it through their school all day long.